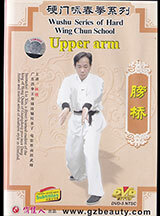 Here is a DVD on the Wing Chun “Upper Arm” set which we believe correlates to “Searching for the the Bridge” in the Yip Man tradition. This is a “harder” form of Wing Chun, and related to Hung Gar. It is not the only Hard version, but one of the better known. This DVD offers a relatively easy to pick up (though not master) sequence. Sifu Lin Xin is well-known (and well-rated by Plum customers) for his teaching in this hard style Wing Chun, as well as his work in Hung Gar and the rarer Hop Gar. Posted October 15, 2018 by Plum Staff. Comments are closed on this post, but you can trackback. Tagged with: Bruce Lee, Hop Gar, Hung Gar, lin xin, peng nam, Randy Williams, tibetan lama kung fu, Wing Chun, Yip Man.